Developing Y5, 6 and 7 pupils’ understanding of religious diversity in the UK. 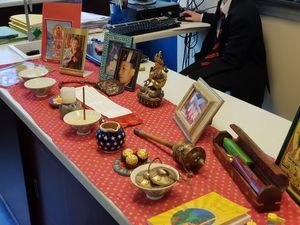 This project brings Y7 pupils from Settle College together with Y5 and 6 pupils from up 8 feeder primary schools in the Settle area to experience and explore diversity through workshops, led by people from a range of different faiths. As part of the day, pupils were trained as ‘Diversity Champions’, empowered to organise and run diversity themed events in their own schools. 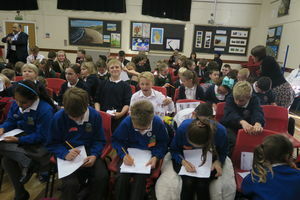 Following the successful ‘Exploring Diversity’ day in Scarborough in October 2016, supported by a Westhill/NASCRE Award, North Yorkshire SACRE wanted to offer a similar experience to pupils in a very different part of the county. North Yorkshire is England’s largest county with a population that is predominantly rural and white British, but rapidly changing with a growing migrant population. Settle and North Craven are still however predominately rural and pupils are predominantly White British. Due to the rural isolation, it is difficult for schools to arrange visits to places of worship (because of the prohibitive transport costs) and it is difficult to get visitors in to school, as they have to travel a fair distance. 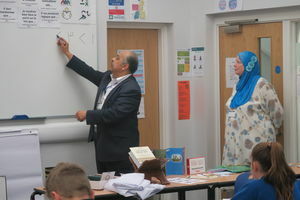 In addition, SACRE were aware that a significant number of schools have had difficulty organising visits to mosques, with some parents withdrawing their children. SACRE has produced guidance for schools, but wanted to do more to raise awareness of different faiths and cultures in schools and local communities, overcoming prejudices that have arisen from the lack of experience of meeting people from different faiths.